The Restoration Industry Association is the oldest and largest non-profit, professional trade association dedicated to providing industry leadership, supporting science, and promoting best practices in the cleaning and restoration industry. Representing over 20,000 cleaning and restoration professionals from 1.100 member firms specializing in textiles, environmental issues, and restoration, RIA provides credibility, education and business improvement events to maximize industry exposure and to advance knowledge in the cleaning and restoration industry. The Carpet and Rug Institute (CRI) is a non-profit trade association representing 95% of carpet manufacturers in the USA. The CRI coordinates other segments of the industry such as distributors, installers and carpet maintenance technicians. CRI continually conducts primary research and gathers data from other sources to help facility managers, installation contractors, building owners and managers, specifiers, architects and consumers. The CRI has a program called the ‘CRI Seal of Approval’. The Seal of Approval is awarded to carpet maintenance providers who use Seal of Approval cleaning products and Seal of Approval equipment. 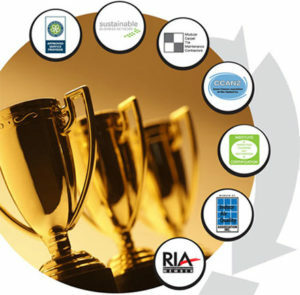 For equipment the Seal of Approval are awarded at bronze, silver and gold levels depending on their ability to deliver sustainable benefits. We promote sustainable practice in New Zealand and support businesses on the path to becoming sustainable. We link businesses and provide a forum for the exchange of ideas and experiences. Prefered nationwide modular carpet tile maintenance contractor for Interface modular carpet tiles and also Onterra modular carpet tiles. Prefered contractor for multiple government departments and a wide range of commercial clients. The Indoor Air Quality Association (IAQA) is an international organization established in 1995 to promote uniform standards, procedures and protocols in the Indoor Air Quality industry. It is dedicated to promoting the exchange of indoor environmental information, through education and research, for the safety and well being of the general public.Indoor Air Quality is the measurement of the indoor air and it’s surroundings that contribute to that quality of the air i.e. an air sample tells us a story about what outputs are being produced by objects in that environment. Enviro has belonged to the IAGA since 2000, and belongs to the IAGA in order to be up to date with the latest world wide research, technology, access to international training qualifications, and to network with indoor air quality experts around the world.